Optional GPS provides location tracking of measurements. The HI9829 is a waterproof portable logging multiparameter meter that monitors up to 14 different water quality parameters. The microprocessor based multi-sensor probe allows for the measurement of key parameters including pH, ORP, conductivity, dissolved oxygen, turbidity, ammonium, chloride, nitrate, and temperature. The probe transmits readings digitally with options to log data while disconnected from the meter. An optional GPS provides location tracking of measurements. The complete system is simple to setup and easy to use. The HI9829 is highly customizable and supplied with all necessary accessories, packaged in a durable carrying case. 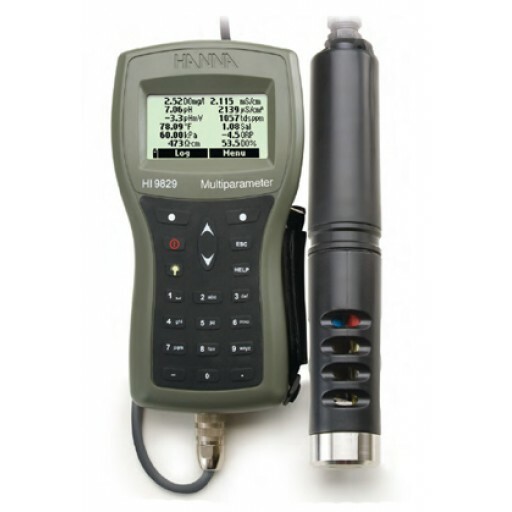 The HI7609829 (basic) and HI7629829 (logging) are multiparameter probes for use with the HI9829 portable meter. It is an option to choose which probe will be supplied with the HI9829. By default the HI9829 and corresponding probe will be supplied with a pH/ORP, conductivity and dissolved oxygen sensors. Either probe can be upgraded to measure turbidity with a turbidity/conductivity sensor. The water quality meter is enclosed in an IP67 rated waterproof casing and can withstand immersion in water at a depth of 1 m for up to 30 minutes. The probe features an IP68 rating for continuous immersion in water. The HI9829 features a backlit graphic LCD with on-screen help and the capability to display up to twelve parameters simultaneously. The graphic display allows for the use of virtual keys to provide for an intuitive user interface. The fitted rubber keypad has dedicated keys for power, backlight, up/down arrows, help and alphanumeric characters. The meter also features two virtual soft keys that navigate the user through the configuration of each parameter, meter setup, and logging of data. The interface is intuitive for any user’s level of experience. Contextual help is always available through a dedicated “HELP” key. Clear tutorial messages and directions are available on-screen to quickly and easily guide users through setup and calibration. The help information displayed is relative to the setting/option being viewed. The probe and meter automatically recognize the sensors that are connected. Any ports not used on the probe will not have the parameter displayed or be configurable. Integrated temperature sensor allows for automatic temperature compensation of pH, conductivity, and dissolved oxygen measurements. The meter features a built-in barometer with user-selectable units for dissolved oxygen pressure compensation. Quick Calibration provides a speedy, single point calibration for pH, conductivity, and dissolved oxygen. Standard calibration options are available including pH up to three points, Conductivity at one point and dissolved oxygen up to two points. HI9829 includes a GLP feature thatallows users to view calibration data and calibration expiration information at the touch of a key. Calibration data includes date, time, buffers/standards used for calibration, and slope characteristics. The HI9829 allows users to store up to 44,000 continuous or log-on-demand samples with logging intervals from one second to three hours. Trend graphing with sample date and time stamp may be viewed on the display or transferred to a pc. Logged data can be transferred to a Windows compatible PC with the included HI7698291 USB adapter and HI929829 software. 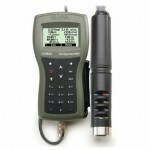 The HI9829 meter, probe, and all accessories are supplied in a rugged carrying case designed to provide years of use. The inside compartment of the carrying case is thermoformed to securely hold and protect all of the components. The meter features an internal 12 channel GPS receiver and antenna that calculates its position to track locations along with measurement data. The quick calibration feature allows for a single point calibration for pH, conductivity, and dissolved oxygen all in few simple steps. Trend graphing with sample date and time may be viewed on the display or transferred to PC. HANNA’s Fact Tracker™—Tag Identification System simplifies test logging. iButtons with a unique ID can be installed at various sampling sites. When the matching connector on the meter contacts the location button, measurements are logged and labeled with the alphanumeric user-entered location ID. Location, date, time and measurements are logged into the meter which can be transferred to a PC. The Fast Tracker™ system complements the GPS for ultimate tracking. Install the optional TAGs near your sampling points for quick and easy iButton readings. Each TAG contains a computer chip with a unique identification code encased in stainless steel. You can install a practically unlimited amount of TAGs. Additional TAGs can be ordered for all of your traceability requirements. The HI9829 and HI98290 (GPS model) are supplied with a HI710140 hard carrying case, HI7612VDC adapter, HI7698292 probe maintenance kit, HI929829 PC application software, HI7698291 USB cable (PC to meter), HI710045 power supply cable, HI710046 cigarette lighter power cable, HI9828-25 quick calibration solution, HI920005 iButton with holder (5), HI7609829-1 pH/ORP sensor, HI7609829-2 galvanic DO sensor, HI7609829-3 EC sensor, HI7698290 short calibration beaker, HI7698295 short protective weighted shield, NiMH rechargeable “C” cell batteries (4), 12VDC power adapter, and instruction manual. 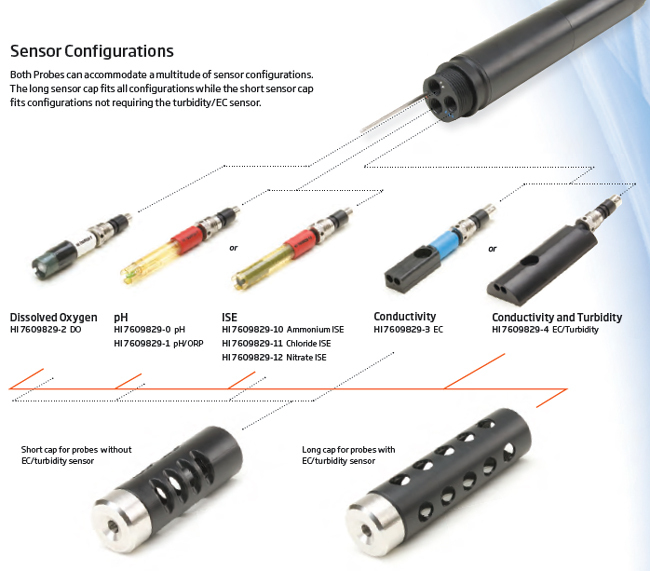 Probes selected with turbidity option will include the HI7609829-4 EC/turbidity sensor, HI7698293 long calibration beaker and HI7698296 long protective weighted shield in place of the EC sensor, short calibration beaker and short protective shield. Probes selected with turbidity option will also include turbidity calibration solutions (230 ml); HI9829-16 0 FNU, HI769829-17 20 FNU, and HI9829-18 200 FNU.